The steering wheel is hooked up to a distance monitor that gathers information from laser range finders, and it uses voice software to tells the driver how far to turn the wheel. For example, the monitor will tell the driver “turn left three clicks.” As the driver does that, the monitor makes three clicking noises. 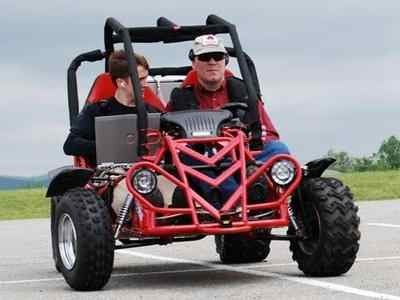 Virginia Tech undergrads packed an all-terrain buggy with technology lifted from the university’s DARPA Urban Challenge entry to create a car the blind can drive. The semi-autonomous vehicle uses a laser range finder, voice software and other sensory technology, and it worked flawlessly when blind drivers took the wheel on a closed course. Advocates for the blind joined the lead researcher in calling the vehicle a breakthrough in independent living for the visually impaired. “We are not only excited about the vehicle itself, but also the potential spinoff technologies from this project that could end up helping the blind,” Dennis Hong, the director of the university’s Robotics and Mechanisms Laboratory, told Wired.com. 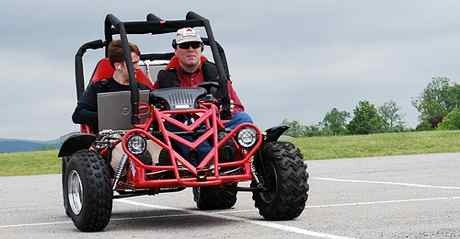 The car was born of a challenge the National Federation of the Blind’s Jernigan Institute issued in 2004 when it called on universities to develop a vehicle for the blind. Virginia Tech accepted the challenge in 2006 — the only university to do so — and received a $3,000 grant to begin the project. The Blind Driver Challenge team at Virginia Tech’s Robotics and Mechanisms Laboratory built the buggy. The steering wheel is hooked up to a distance monitor that gathers information from laser range finders, and it uses voice software to tells the driver how far to turn the wheel. For example, the monitor will tell the driver “turn left three clicks.” As the driver does that, the monitor makes three clicking noises. Hong wants to continue working on a tactile map interface. The system, called Airpix, shoots compressed air through tiny holes on a screen in real time, to provide a layout of the area surrounding the vehicle. Drivers can “read” the map with a hand, much like Braille. Hong said he needs more feedback from the blind and visually impaired to refine the system. All this technology is clearly in its earliest stage,s and we’re a long way from the day when the blind join us in slogging through the morning commute. But the Federation for the Blind hailed the vehicle and the promise it offers. 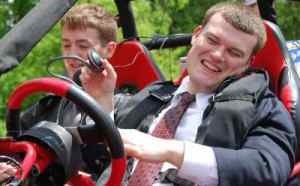 Majerus drove the car and said, “It was great.” Mark Riccobono, executive director of the Jernigan Institute, called his test drive historic. “This is sort of our going-to-the-moon project,” he said. Although the technology is progressing, laws prohibiting the blind from driving — not to mention public perception about that possibility — must be changed, Hong said. That is why the Blind Driver’s Challenge team will be promoting the vehicle’s technology at a National Federation for the Blind–sponsored parade in Washington, D.C.